The Bloomsbury Festival returns this weekend, with a three-day celebration of arts, culture and education. An all-embracing programme of events focusing on both the traditional and the contemporary will occupy over 50 locations in and around the leafy streets of the area. The festival kicks off on Friday evening in Russell Square with a performance of dancing fireflies inspired by the Grant Museum of Zoology (6-8pm) and continues on throughout Saturday and Sunday. As you might expect from the home of Virginia Woolf and co, literary types will be well catered for with readings from emerging and established writers. Look out for Cream Tea and Conversation, a celebratory talk on Persephone Book's 100th publication merrily washed down with a cup of cream tea (Sat 4.30-5.30pm). Poetry lovers can take part in a poetry activist workshop (Sun noon-1.30pm) and readings from A Bloomsbury Foursome (Sat 6-6.45pm). A special focus on visual art and architecture will see guided walking tours highlighting the often overlooked merits of newer buildings in the area (Sun 2-2.30pm). You might even be able to grab a ticket to look round the tower of Senate House, the Art Deco masterpiece that looms over the neighbourhood. If that’s not your thing, you can put your opposable digits to good use by contributing to a vast thumb-print painting of a brace of doves (Sun 11am-4pm). Music buffs can enjoy the best of the area’s un-amped acoustic talent from Hush (Sat 6-11pm), or head over to the ever-popular SOAS World Music Stage in Russell Square, where musicians from Africa, Asia, Latin America and Europe will be playing across Saturday and Sunday. Families will also find much to do, with participatory activities such as caricature drawing (Sat 1.30-2.20pm, Sun 3.30-4.20pm) and digital photography lessons for children aged three and up (Sat 11.30am-3.30pm). The festival takes place 19-21 October and all events are free. Tickets for some events can be pre-booked but can also be collected on the door. Check out the Bloomsbury Festival website for a full list of events, times and locations. By Jodie Shepley. 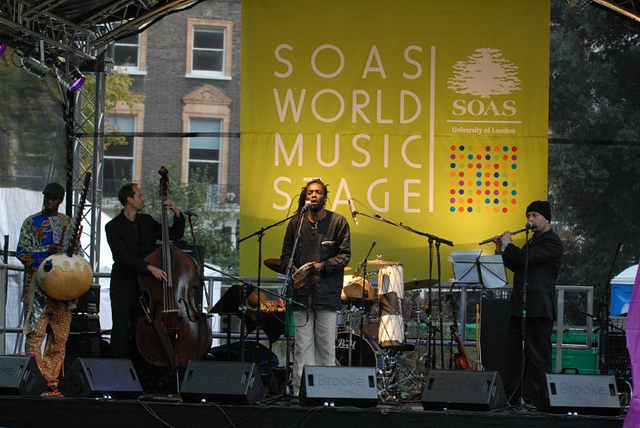 Image of the SOAS World Music Stage by McTumshie in the Londonist Flickr pool.